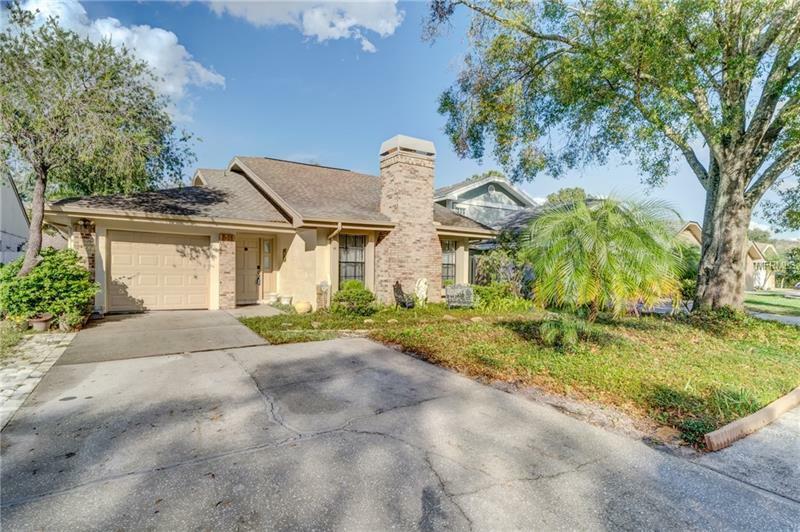 Charming Carrollwood Village home with 2 bedrooms, 2 bathrooms, 1 car garage and in ground pool! This home has been well cared for. Living room offers vaulted ceilings, wood burning fireplace and neutral carpet. Formal Dining just off the kitchen. Kitchen also features vaulted ceiling, new faucet, dishwasher, stove with glass cooktop, refrigerator, microwave, closet pantry and breakfast bar. Covered/screened side porch off the Living room has brick pavers and offers shade from the elements. Master bedroom has neutral carpet, walk in closet and sliding glass doors leading to the pool. Master bath has dual sinks, jetted garden tub and walk in shower, and access to the pool. Guest bedroom has neutral carpet, closet and access to a guest bathroom with shower/tub combo. Outside pool area offers beautiful landscaping, brick paver pool deck, fenced yard for privacy and covered lanai. This community offers basketball courts, tennis, playground, dog park, golfing, country club and more! Water heater less than 1 year old, new pool filter, brick pavers at pool and side yard are less than 1 year old.